The Project and Programme Management theme covers a number of different topics. It is an important area and therefore, in conjunction with our partners (the Association of Project Management), a series of webinars was developed in order to disseminate the learning specifically around Programme Controls from the Crossrail project. These webinars provide an opportunity to hear directly from those involved in the delivery of the project and how key areas were managed. At the end of each webinar a question and answer session was provided for the participants to ask about the information presented and learn about the experience of the presenters themselves. 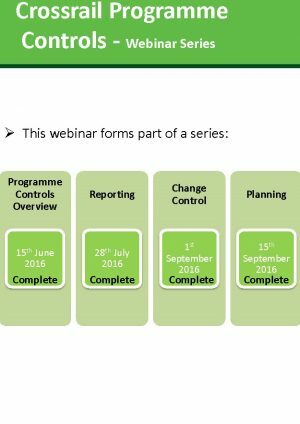 The Learning Legacy webinar series sought to share the learning from the processes and systems with the explicit intention of helping others establish an approach that delivers effective and efficient Programme Controls. It aimed to explore the accountabilities and approach to controls and to suggest the applicability for future projects or major programmes. In total there were 7 webinars in the series and all of them are available to view below.